All harnesses fully assembled for easy installation. Heavy duty relays provide better reliability. Four-button operation for easy use. Ignition safety disables door release when engine is running. 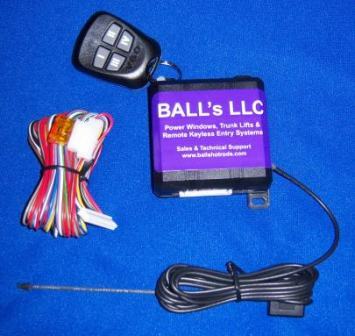 Kit includes 1 receiver w/ transmitter, assembled harness w/ 5 relays, and the instructions. Opens Door up to 50 feet away. Transmitters won’t work when ignition is on. Easy to install; comes with detailed instructions. Independent control of driver and passenger door latches. Rolling code technology. This assures NO duplication. Location of each wire marked every 10” easy to read.